Today Changepoint announced their acquisition of Daptiv, adding pure cloud solutions for professional services automation (PSA) and project portfolio management (PPM) to the Changepoint portfolio of OnPremise and hosted products. Changepoint, a long time TSIA partner and advisory board member, has been the top installed PSA platform for the last two years, according to my annual Global Technology Survey, and this acquisition will give them even more reach into PS, IT and development organizations wanting a SaaS solution. PSA has three main modules: resource management, project management, and project accounting, and is used by professional services teams to automate the staffing of projects to maximize utilization rates, as well as providing dashboards so managers can track project status, costs and margins, identifying problems early enough to step in and correct the problem before the customer or project is impacted. PPM offers similar capabilities for IT and development project teams, matching skills and experience to projects, tracking project milestones and deliverables, as well as total costs for internal projects. Changepoint’s PSA offering, available in OnPremise or Hosted options, is ideal for large organizations needing sophisticated capabilities. I’ve praised them in the past for their innovative approach to analytics, imbedding IBM Cognos into a release last year to deliver real-time management dashboards. However, with IT departments being downsized, more companies want at least one pure SaaS provider on the short list when evaluating PSA vendors, and Daptiv gives Changepoint a competitive edge, since they now can compete in deals for any deployment model. Daptiv has been receiving good reviews for their technology, including a strong position in the Leader quadrant in the 2014 Cloud PPM Magic Quadrant from Gartner. Gartner even notes that Daptiv has been moving upmarket, with their average deal size now more than 200 seats, meaning they are competing with traditional players for large enterprise deals. Interesting, Daptiv has also imbedded IBM Cognos into their application for sophisticated analytics and dashboards, which provides a nice consistency across the Daptiv and Changepoint product lines. Congratulations to the Changepoint and Daptiv teams on the deal! And as always, thanks to you for reading! Vinod Mohan: TSIA has published a lot of research about the rise of technical complexity and the impact it is having on enterprise support organizations. Could you talk about this complexity and some of the related drivers/trends? John Ragsdale: In our support services benchmark survey, we asked the question: “How complex are the products your company supports?” The range of options include standard complexity, moderately complex, and highly complex. In 2003, less than half of tech firms defined the technology they sell and support as “highly complex.” Today, more than two-thirds of companies say their products are “highly complex.” This rising complexity has big impacts on support organizations. When I first started as a technical support rep back in the 90s, by the time I finished training and went live on the phone, I knew how to handle more than half of the problems I would encounter. After about 6 months on the job, I’d seen just about every problem customers could potentially have. Today, because products are loaded with features and customization options and run on a myriad of platforms, it takes years to really become an expert on a product. This makes the learning curve extremely steep for “newbies” just out of training. In addition to product complexity, technology environments are contributing to the complexity. Today’s hardware and software tools are so tightly integrated and interconnected that it is hard to identify a single failing component. As a result, we see average talk times and resolution times stretching out and first-contact resolution rates trending downward. Vinod: Each year, you do a survey that tracks technology adoption and spending plans for tools used by service organizations. I know that remote and proactive support technology is one of the categories you track. Could you share some of your data around this technology category? John: Currently, just over one-third of enterprise technology firms (37%) have remote/proactive support tools in place. However, just over half (51%) have budget for these tools in 2014-2015. Any time you see half or more of tech companies investing heavily in an application category, you know that an industry shift is occurring. In this case, service organizations are looking for opportunities to dramatically improve service levels without hiring more employees, and remote and proactive support tools can help achieve this. I expect to see the adoption numbers rising each year until the technology is as common as CRM, incident management, and knowledge bases. I really can’t imagine a technology support organization in 2014 functioning without remote diagnostics and monitoring. Vinod: TSIA launched a new association discipline on managed services last year. 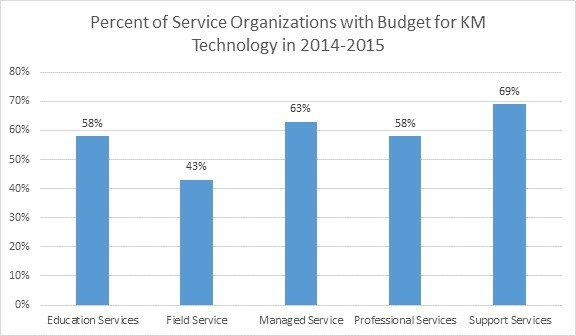 Could you tell us TSIA’s definition of managed services and why you see this as a hot investment area for technology firms? John: The easiest definition of managed services is “paid to operate.” Clearly, IT departments don’t have the staff they did a decade ago, but their hardware and software environments are bigger and more complex than ever. When a company is struggling to manage all the equipment and software in their environment, they often look to the vendor of that technology to assume responsibility for maintaining it, customizing it, upgrading it, and supporting it. In other words, the vendor’s managed services team becomes an extension of the customer’s IT team. TSIA sees this as one of the fastest growth segments for services, and more tech firms are looking to managed services to generate additional services revenue. While many companies are investing in cloud solutions to minimize their IT footprint, the truth is that many cloud solutions are best suited for smaller firms. Large companies need highly sophisticated enterprise tools, which usually means owning the implementation. Managed services allows a company to have a “best of breed,” on-premise implementation, but with none of the ownership headaches. Vinod: Earlier this year you conducted a survey of your managed services members specifically around the technology they use to remotely support and manage customer hardware and software. What were some of your findings from that survey? John: George Humphrey, head of our managed services research, will be publishing the findings from that survey in time for our October conference. But a sneak preview of the data shows that the majority of managed service operations have made heavy investments in technology to support remote customer equipment, including proactive monitoring of application and network performance, ITIL-compliant help desk tools for incident and problem management, configuration management databases (CMDB), and release and capacity management. This survey was what first brought SolarWinds to my attention, because half of the companies surveyed were using SolarWinds for application and network monitoring. Vinod: We see great interest from our customers around improving the efficiency of support and ITSM when there is always a growing volume of tickets and a lean support staff. How big of a role do you think technology like SolarWinds plays in efficiency improvements? John: I’ve been involved in the support industry for more than 25 years, and I can tell you that more than any other department in the company, support and help desk operations are experts on “doing more with less.” We are often the first hit with budget cuts and downsizing, and unfortunately, many service teams are still being operated as a cost center. We hire smart people, train them well, and our processes are fine-tuned and compliant with industry best practices. In my opinion, it’s up to technology to “take us to the next level” for efficiency and productivity improvements. Over the last decade, tools proven to work within IT help desks are finding larger adoption among external customer support teams, and definitely within managed service operations. Flexible and customizable help desk software for ticketing automation can easily reduce the time to open and manage incidents. IT asset management is critical to know what equipment is where and who is using it. Change management can automate common, repetitive processes—from adding new users to upgrading systems—making sure every process is complete and accurate. Underlying all of this is knowledge management—capturing new information in a searchable repository so no one ever has to “reinvent the wheel” to solve a problem. Vinod: You have conversations with companies about selecting and implementing remote support technology. Where does the ROI for this investment come from? John: Remote and proactive monitoring technology has huge potential for lowering support costs, increasing service levels, and ultimately improving customer satisfaction, loyalty, and repurchase. By identifying problems at a customer’s site quickly, support can fix the problem before it impacts end-users. This increases uptime and lowers the cost of supporting customers. In fact, we’ve had members present case studies at our conferences showing that customers who encounter problems and have them fixed rapidly have higher satisfaction and tend to buy additional products—knowing that you will take care of them no matter what happens. A surprising fact one large hardware company uncovered is that customers who experienced a fast resolution to a problem are actually more satisfied than a customer who never encountered a problem. And, we are seeing more companies leveraging remote support to generate revenue by offering this capability as part of a premiere support package. Vinod: John, thank you for taking the time to speak with me today! John: It has been my pleasure. Thanks for having me! I hope everyone tunes in to our live webinar, “Managing the Complexities of Technology Support,” on August 21st, at 10am PT. If you aren’t able to attend, register anyway. We’ll send you a link to watch an OnDemand version of the event, as well as a link to download all the presentation materials. And as always, thanks for reading! You are currently browsing the Ragsdale’s Eye on Service weblog archives for August 2014.